"There is something about Hitler and Germany that somehow makes it difficult to feel sorry for them when they get slaughtered at football. You just think, Hitler, Hitler, Hitler, Hitler, Hitler", said Olsson on his live chat show 'Olssons studio'." Looks like Mr. Jackson is kicking things up a notch in the upcoming film, "The Spirit." We dunno why he's dressed as a Nazi, but he seems to change outfits in every scene, based on the trailer. Kinda reminds us of Black Midget Hitler. 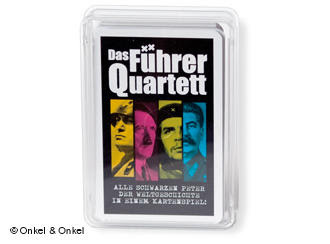 A publishing house in Berlin has released a card game featuring 32 dictators, including Adolf Hitler. The creators wanted to make an ironic statement about the tyrants but not everyone appreciates the joke.